Taste test: Frito-Lay has joined the 100-calorie snack revolution by taking a bunch of Doritos and putting them in individually sized snack packs. There were five bags in this box, each good for lunches or for people who count calories and want a portion-controlled snack. The Doritos were pretty much regular Doritos, except smaller. 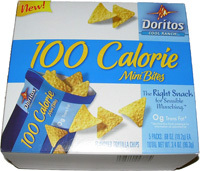 (With regular-sized Doritos, you would get just about five chips to equal 100 calories.) The smaller pieces made it seem like I was eating more Doritos than I was, which could help people who might open a regular bag and eat about three servings before stoping. The shrinking of the Doritos triangles didn't change the taste at all. They still tasted like Cool Ranch Doritos. 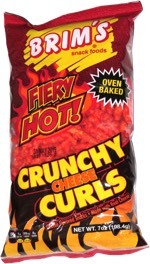 Smell test: These didn't smell like ranch, just smelled like regular Doritos.